. 10th July, 2018 . Looking for ways to get more Vodafone airtime and enjoy extra data? Yes? Then find out about exciting Vodafone offers below. This is a special daily offer given to Vodafone prepaid customers. With Vodafone Made4Me, Vodafone Ghana presents you with new exciting offers in the forms of data and airtime each day. Vodafone Made For Me offer includes Vodafone 2GB for 3 days, 5GB for 5 days and many more. Dial Vodafone Made For Me code *530# and select the offer you want to enjoy. If you have registered for Vodafone Cash, you get to enjoy special data bundles. For GHc 1, you get 500MB of data which is valid for 1 day, and GHc 2 for 1.5GB data also valid for 1 day. Dial Vodafone Cash short code *110#, choose Buy Airtime or Data and select Special Offers to enjoy the special offers. This is Vodafone Ekikimi (our favorite offer), just rebranded as Vodafone Magic. With this offer, Vodafone customers get up to 10 times bonus on all top ups worth GHc 2 and above. You also get to enjoy 10.5p for every minute on all local calls and 10.5p for 1MB of internet data. Just like the Vodafone Ekikimi, dial the short code *135# to subscribe. Vodafone gives you 200 minutes airtime to call Vodafone numbers, 15 minutes airtime to call other networks, 50MB data and 20 SMSes to Vodafone numbers for 3 days at only GHc 2. 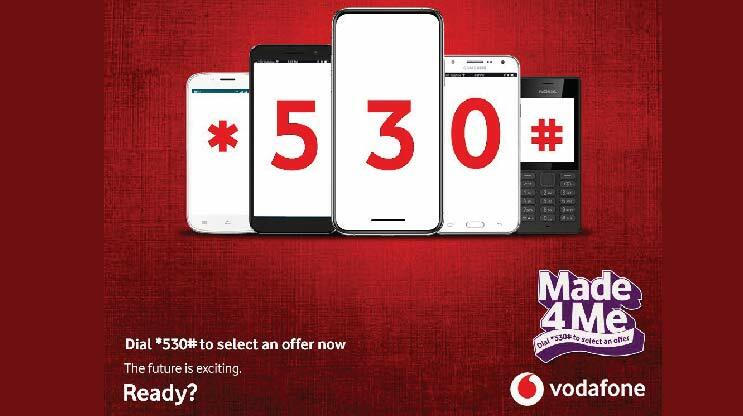 Dial 5544 to subscribe for Vodafone 2 Cedis Offer. You will be charged 2 Ghana Cedis for this offer. Once you subscribe, Gh 2 will be deducted from your credit balance for renewal every 3 days. Note: You must have a minimum of 2 Ghana Cedis to subscribe for this offer. Well, if you have never tried Vodafone X before, you should now. Vodafone X is tailor made for the youth but anyone can subscribe for this offer. Vodafone X is available to all prepaid mobile subscribers. You can subscribe for the package by dialing *5888# or calling 5888. Vodafone X comes with free calls to other Vodafone X subscribers, and other cool social media data packages. Don't forget to download and install the My Vodafone app in your app store to get a welcome free Vodafone X data when you "shake" your phone. Which other awesome offers haven't we mentioned above? Kindly share below.